I have to declare victory for the team over at Gollancz for yet another great cover. 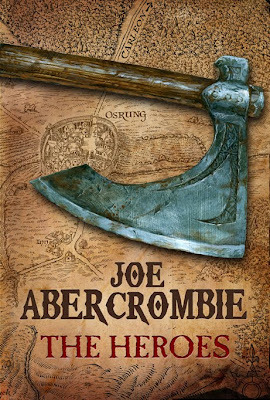 The bloody US cover is alright (and much better than the atrocity that was their version of Best Served Cold) but Abercrombie covers have become synonymous with objects placed over a bloody map. It just conveys the tone of looming bloodshed so perfectly, and so much more subtly than the gorefest on the US cover. More Black Dow! Very excited for that. Right now I plan on ordering the UK version for the cover art continuity but as I mentioned yesterday, The Heroes is probably my most anticipated fantasy tome for 2011. I may just defer to whichever method gets me the book faster. 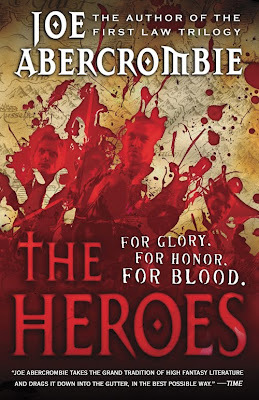 The Heroes will be published by Gollancz in the UK on Jan 20th, 2011. Orbit will publish the US edition two months later in March. I don't think I'll be able to wait.